HomeFor ClientsAnalyticsForex Analysis & ForecastsForex Technical analysis and forecastsForex Technical Analysis 2010/11/29. 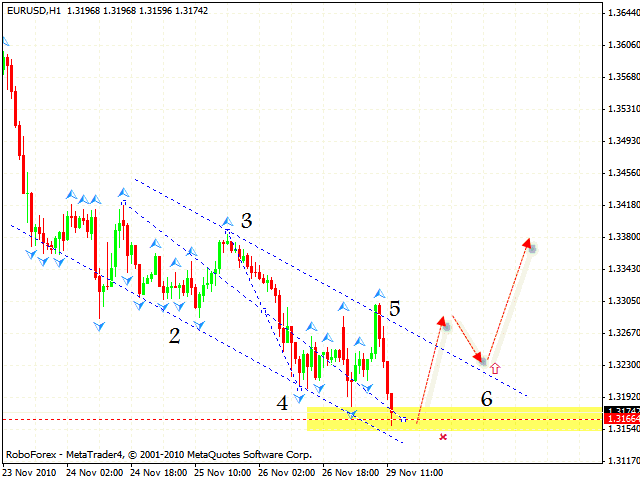 EUR/USD, USD/CHF, USD/CAD, NZD/USD, GBP/JPY Forecast FX. Forex Technical Analysis 2010/11/29. EUR/USD, USD/CHF, USD/CAD, NZD/USD, GBP/JPY Forecast FX. As it seen from eurusd forecast the EUR/USD currency pair has completed one more descending pattern and reached a new local minimum. There are no signals to sell the pair at current price, that’s why after the price leaves the channel’s borders one can try to buy it. The stop must be behind local minimum. But in case the reversal pattern is formed, it must be below the shoulder. Franc has reached new maximum. All the targets of the rising pattern with the target in the area of 1.0010 have been reached, and at the moment we can see the formation of “head & shoulders” reversal pattern. 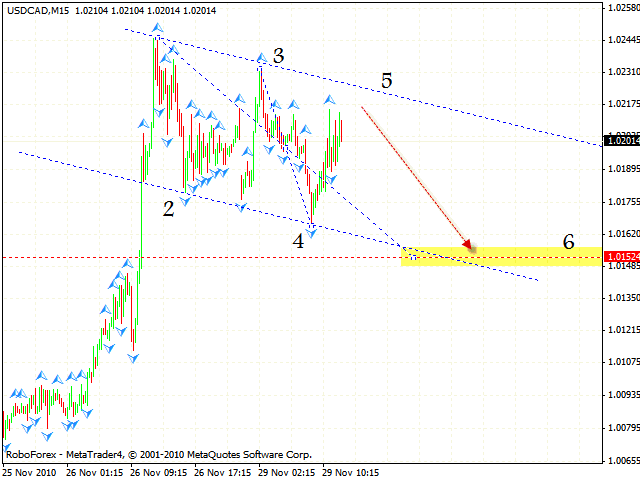 Judging by technical analysis usd chf you can try the tight stop sales even now. After the neckline is broken, one can increase the amount of short positions. The target of the possible fall is the area of 0.9915. Canadian Dollar has completed “failure swing” pattern at the RSI and at the moment is forming the descending pattern with the target in the area of 1.0150. 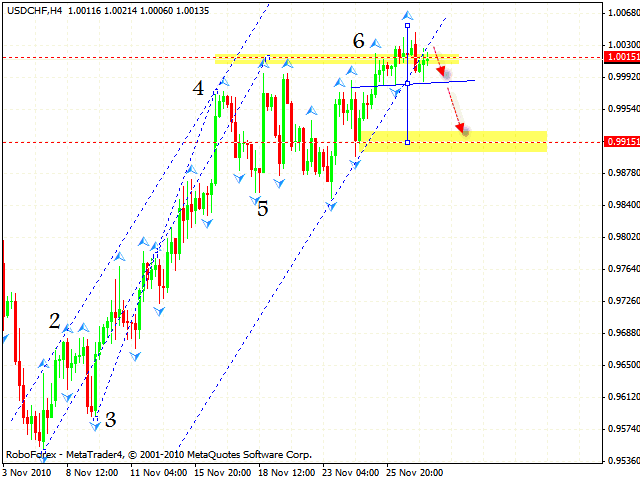 According to usd cad analysis you can try to sell the pair with the stop above 1.0217. If the price leaves the descending channel, one is recommended to close positions on the pair. In case of the NZD/USD currency pair we have “head & shoulders” reversal pattern forming with the target in the area of 0.7618. 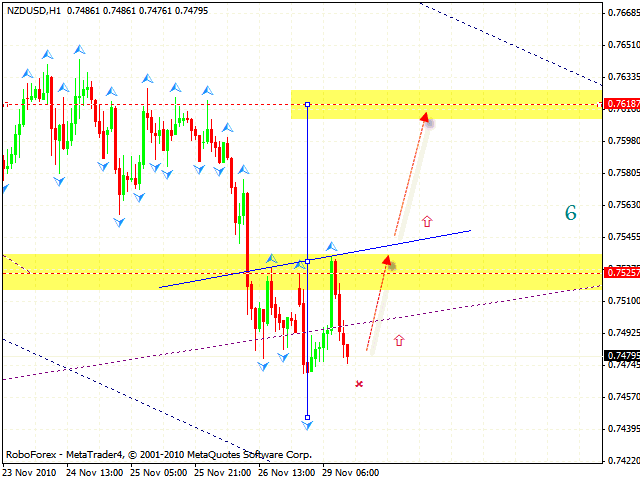 Judging by nzdusd forecast you can try to buy the pair only after the neckline is broken. In case the price reaches a new local minimum, we shouldn’t open long positions. 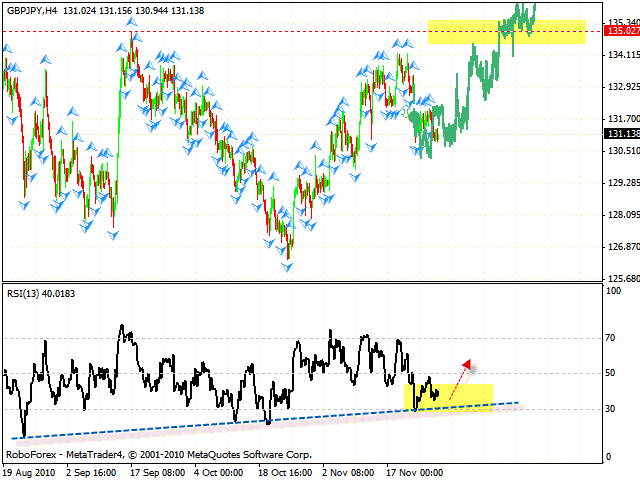 In case of the GBP/JPY currency pair there is a possibility of the rising trend with the target in the area of 135. At the daily forex online chart the RSI indicator has broken the descending trend’s upper line indicating the rate growth to the upper border. 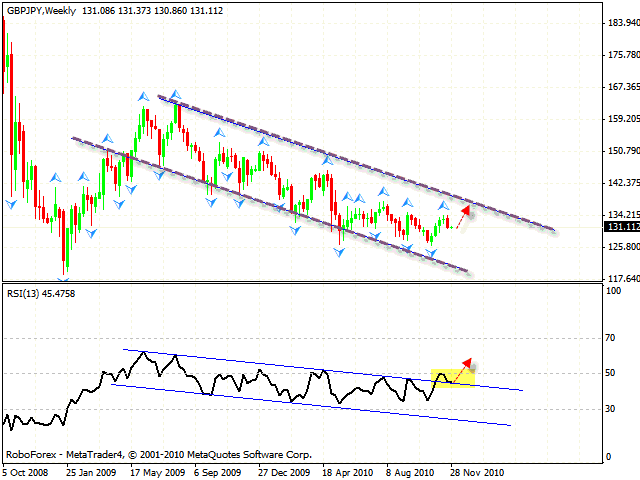 At the H4 chart we can see divergence forming at the RSI. if the price reaches a new minimum, one can try to buy the pair with the tight stop. The RSI indicator was supported by the rising trend.